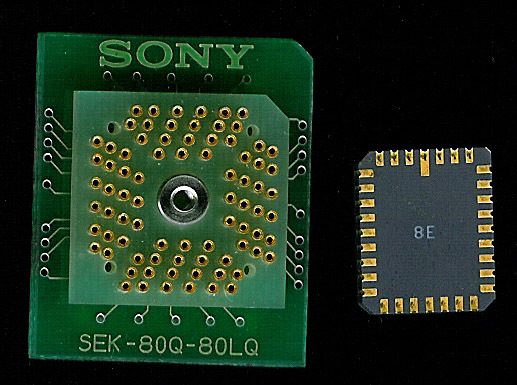 I recently was surfing eBay and found some Sony microcontrollers, while looking over the datasheet, I noticed the package looked very familiar, a stacked MCU, over a LCC EPROM. I have a similar device in the museum. If you haven’t noticed, we haven’t added new CPU’s to the museum in sometime. Not to fear, we have been getting LOTS more. It just became a huge time killer to upload and add them. Currently we have the programmers building a whole new database system for easily managing all the chips in the museum. 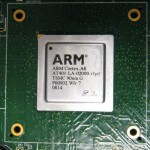 ARM Prototypes: Coming soon to a netbook near you. ARM is solely an intellectual Property company. They design, and then license production of their ARM cores to other companies. However when they create a new core, they DO have it produced, in silicon for testing, and for use in toolchain makers to develop compilers etc for. Here are 2 such devices, one the ARM Cortex-A8, which in its fastest version (1100MHz+) can handily beat an Intel Atom in netbooks. The Cortex-A8 is used in the just release Palm Pre. 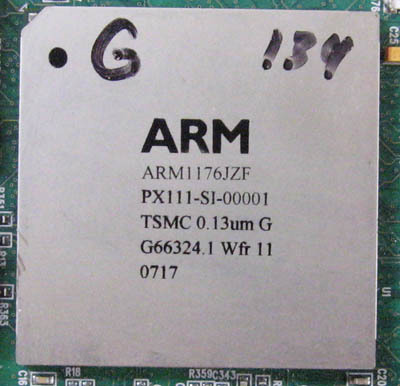 The ARM1176JZF is used in such devices as the iPhone. 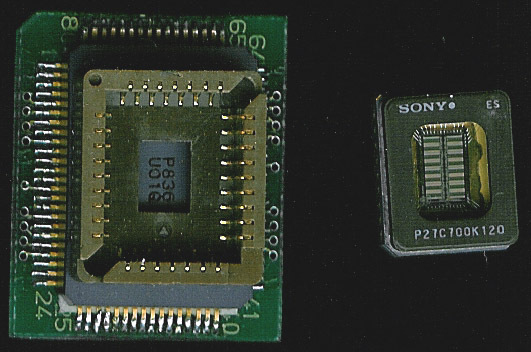 Both of these were fabbed by TSMC. Thanks to Mr. Boys of ARM for the photos. Intel, made their long anticipated announcement today. Much speculation floated last week as to what they were to announce. Today they announced a partnership with TSMC in manufacturing the Atom CPU core. Intel is hoping to take on the likes of ARM, and XAP, and other licensed cores by doing so. TSMC excels in integrating third party designs and will do so with the Atom, the idea being to build custom ASICS’s and SoC’s around the Intel Atom core. This MAY be a boon to Intel, allowing them to finally break into the mobile devices (phones etc) in a much broader way then the old PXA line that they sold to Marvell. 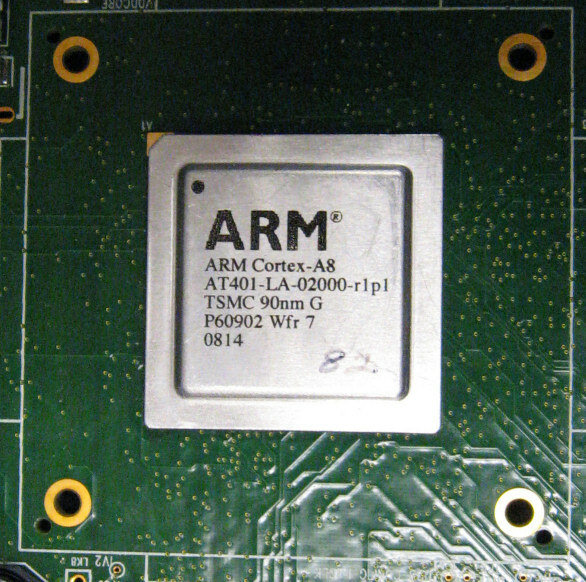 Recently we have talked a lot about two important CPU architectures, the XAP, and the ARM. 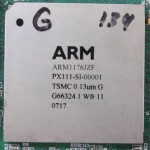 ARM recently announced the Cortex-M0 which is implemented in 12,000 gates. Today we received some samples from Ember, makers of very efficient ZigBee wireless chips. Their two main ZigBee solutions are the EM250 SoC, and the EM260 co-processor. As the heart of each of these designs is a XAP2b processor core. a 16 bit RISC design running at 12MHz and implemented in 12,000 gates. 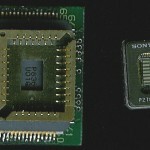 The EM250’s chip area of a mere 7mm square, but pack an enormous punch, integrating a complete ZigBee wireless radio, 128Kb of flash, and 5Kb of RAM.